The Grass Is Always Greener On The Other Side, And Now You Can Prove It | OhGizmo! By Andrew Liszewski on 07/08/08 • Leave a comment! From designer Alice Wang comes this peculiar concept device that quite literally allows you to determine whose grass is actually greener. The Grass Scanner pictured above will take a reading from 3 random patches of grass and will then output a Pantone color code that can be used for comparison against other patches of grass. So if you happen to live in a neighborhood where the condition and maintenance of your lawn affects your social status, you’ll finally be able to determine just how sad your life really is. 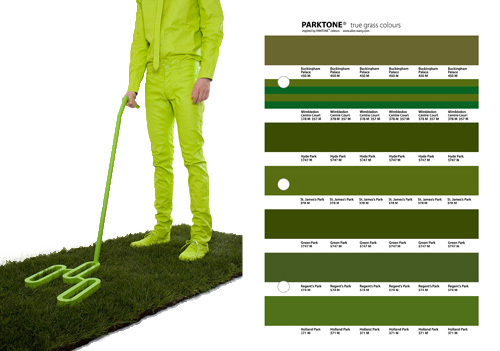 The designer also created something they call the Parktone color card which allows you to compare the Pantone values of your own lawn against the lawns of some of the better kept Royal Parks and gardens in the United Kingdom. Now I’ll definitely give the Grass Scanner high points for originality, but don’t expect to find one at your local Home Depot since it’s probably never going to make it past the concept stage.